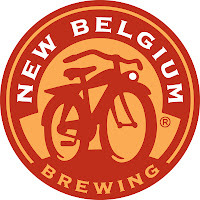 New Belgium Brewing out of Fort Collins, Colorado makes some mighty tasty and popular brews. Their Fat Tire Ale is one of the more popular craft brews in America because, well, it is good stuff. 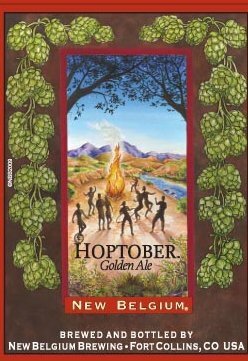 For now though, we are looking at one of their Fall seasonal releases: Hoptober. I'm not sure if they were going for a twist on an Oktoberfest or Marzen-style beer, or just doing whatever the Hell they wanted for a Fall release. Regardless, this beer is a blonde ale at 40 IBU's and 6% alcohol. Nothing remarkable there. It is reportedly brewed with five different hops and four different malts. That certainly sounds promising. Hoptober pours a clear, light gold with a small head. It smells of very light malts, yeast, and faintly of mild hops. Tasting it is much the same as the smell: crisp light-roasted malts, bready, yeasty, with some vague citrusy hops. It really is quite light and subtle. Unfortunately, with a name like Hoptober I, personally, expected something with... hops. You know, those things that give beer much of their flavor? I thought this was going to be an Oktoberfest/IPA hybrid, but no. It's not. It's a pretty standard, golden ale that just has a clever name. Why are the five different hops so passive? Why is this a Fall-only release? I'm really not sure. The hops are really quite subdued, but hey, it's still not bad tasting. I wouldn't pass it up if someone offered one to me, but I don't think I'll be buying more. Despite what this beer tastes like, at the end of the day, I really just want to party around a fire like the people on the label... especially the guy on the unicycle.